1. Support and encourage local emerging photographers to develop and exhibit their works to the public in Malaysia. 2. Represent cultural diversity through photographic exhibitions. 3. Strengthen regional identity and assisting the development of cultural tourism in the region. 4. Nurture and raise the profile of local photographic talents. – Entries shot on either film or digital cameras are eligible for submission. However, all images submitted must be in digital file format. – Series of Work: Each series of work shall contain 12 images. – The photograph must not contain obscene, provocative, defamatory, sexually explicit or otherwise objectionable or inappropriate content. 2. The photograph, in its entirety, must be a works of original material taken by the entrant. By entering the competition, the entrant represents, acknowledges, and warrants that the submitted photographs are original works created solely by the entrant, that the photograph does not infringe on the copyrights, trademarks, moral rights, rights of privacy/publicity or intellectual property rights of any person or entity, and that no other party has any right, title, claim or interest in the photograph. 3. The organiser reserves the right to exclude or withdraw from the contest any work that is deemed inappropriate in content or that, for any reason, display of the image exposes the organiser to risk of legal proceedings. 4. Reproduction Rights of Organisers and Sponsors: The organisers and sponsors reserve the right to free reproduction and exhibition of the submitted images in all media, printed and on-line, but only in connection with KUALA LUMPUR PHOTOGRAPHY FESTIVAL; Photo Creator Magazine; Advanced Images Magazine; Fotografika Magazine and their promotions. The copyright will, at all times, be retained by the photographer and, where an image or images are reproduced by the organiser or sponsors, the photographer will be credited. 5. The organisers will not be liable for technical, hardware, or software failures of any kind or lost or unavailable network connections which may limit or prohibit an eligible entrant’s ability to participate in the competition. 6. By submitting to this contest, all entrants agree to abide by each and all the Rules under the terms and conditions. Any breach of these Rules by an entrant will void their entries. The KLPF organiser reserves the right to amend any of these Rules without prior notice. Any amendments will be published on the website www.klpf.com.my and it is the entrants’ responsibility to check up the website for any amendments. – Entrants must submit from 06 January 2014 to 30 June 2014. — Images submitted must be 300dpi resolution and printable up to 10” x 15” size. — Entries must be digital image files in JPEG or JPG format only, can be in colour or black & white. — Shortlisted entries will be selected by a panel of judges. All short-listed entrants will be notified by email in August 2014. — Entries may be submitted via email to klpf@pcp2u.my or via CD courier/mail to PCP Publications, 154-4-1, Kompleks Maluri, Jalan Jejaka, Taman Maluri, 55100 Kuala Lumpur. — Participants are required to provide participant’s name/IC/address/phone number and photographer’s background. – Short-listed photographers will have their selected work printed and exhibited during the KLPF 2014. — Short-listed photographers are required to present/explain their work to the panel of judges during the final judging event. — Short-listed photographers will also have to submit 3 images shot on the spot with topic/s provided by the organising committee. These 3 images will be awarded points as added bonus. 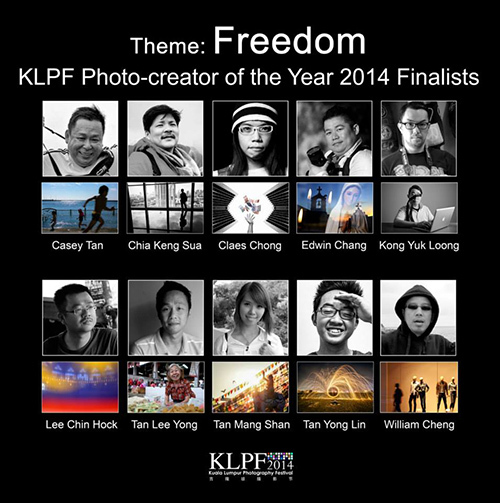 A certificate of recognition as KLPF Photo-creator of the Year 2014. — The winner’s work will be featured in Advanced Images, Photo Creator and Fotografika magazines. — Selected piece/s of the winner’s works may don the cover page of Advanced Images, Photo Creator or Fotografika magazines. The organizer is calling for submissions of images (colour or b&w) from photography enthusiasts. Your most creative images may be selected to exhibit at the Kuala Lumpur Photography Festival. 1. This exhibition is open to all interested photographers. 2. By submitting their work, participants confirm that the submitted images are original work created solely by the entrant, that the photographs do not infringe on the copyrights, trademarks, moral rights, rights of privacy/publicity or intellectual property rights of any person or entity, and that no other party has any right, title, claim or interest in the photograph. 3. By submitting to this exhibition, all entrants agree to abide by each and all the rules under the terms and conditions. 4. Entries must be image files in RGB jpeg format only, must be related to the theme “Vibrant Festivals”. 5. Entries may be in colour or black & white. 6. Images submitted must be 300dpi resolution and printable up to 12×18 inches. 7. Each entrant may submit up to 10 images (maximum). 8. Images must not have any borders or film edges, name, personal logos or watermarks. 9. The theme “Vibrant Festivals” may be expressed in its widest sense, in relation to images depicting people/expressions/moments of festival, culture, tradition, religious or any kind of festivals. CD courier and mail to PCP Publications,154-4-1Kompleks Maluri, Jalan Jejaka,55100 Kuala Lumpur,Malaysia. indicate “Vibrant Festivals” on envelope or as email subject. include photographer’s name & portrait photo, mobile phone no., email address & nationality. include a photo caption (not more than 12 words) & the location. 11. Only work that are selected by the organiser will be reproduced for the exhibition. 12. Participants who require their exhibited work to be returned may collect them personally at PCP Publications office after the exhibition. OR participants can send a self-addressed stamped envelope with minimum size 12×18 inches to have the exhibited work mailed to you. The exhibits will be retained for a period of one (1) month after the exhibition. After which, they will be disposed. 1. PCP Publications reserves the right to exclude or withdraw from the exhibition any image that is deemed inappropriate in content or that, for any reason, display of the image exposes PCP Publications to risk of legal proceedings. 2. PCP Publications reserves the right to free reproduction of the submitted images for the above mentioned exhibition at KUALA LUMPUR PHOTOGRAPHY FESTIVAL 2014 (19-21/September). The copyright will, at all times, be retained by the photographer and, where an image or images are reproduced by the organiser, the photographer will be duly credited. KLPF 2014 offers exhibition space for photographers – professional & amateur – to showcase their profiles, establish new contacts, build networks and explore possible new business ventures. Genre : Portraitures, Wedding, People, etc. Package inclusive of exhibition booth, booth labelling, 4 photo prints with poster frame (size 20×30 inch each) and 1 profile photo print (size 24×48 inch). Genre : Conceptual, Fine Art, Landscape, Nature and all. All photographic work will be curated by our professional photographer Kim Teoh. Participating photographer is allowed to exhibit a minimum of 4 pieces of work (20x30inch) and 1 piece of personal profile (24x48inch). Maximum number of exhibits is 8 pieces. Additional photo prints are chargeable at RM150 per piece (20x30inch). Limited to 10 photographers only. Interested photographers may contact us by email klpf@pcp2u.my or phone +603-9281 8039. Closing date 30th July 2014 or until all exhibition lots taken up. Note: KLPF organiser reserves the rights to ammend the above conditions as and when necessary.